Sometimes there is nothing left for us to do except praise God! While we may sometimes dream of doing great things for God and his Kingdom, the dreams aren't as big as God's plans. While we may be richly talented, influential, powerful, or rich, these are merely tools in God's hands, not symbols of our sufficiency. "God is able" has to be one of the best and most accurate phrases in the Bible. But this time, it's said about his work in you in me. 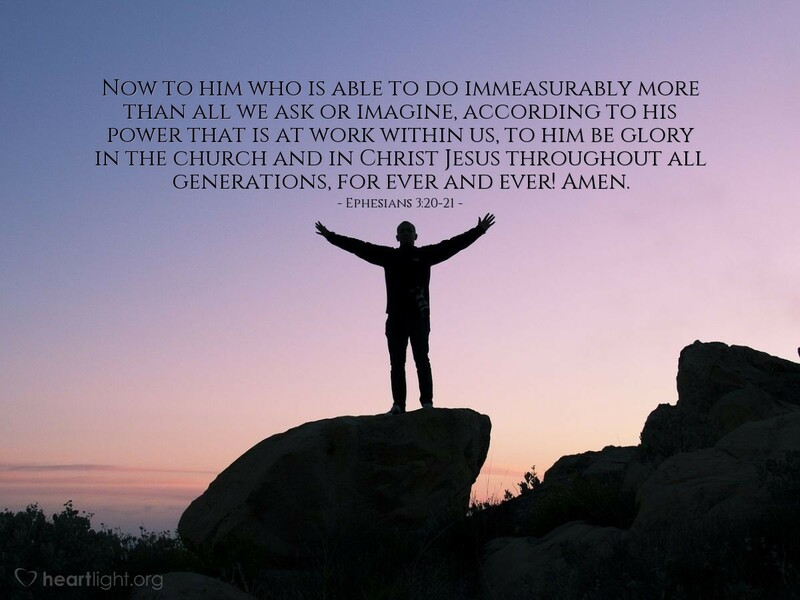 He is able much more than we imagine to work through and in us. What can we say to that? Hallelujah! Loving Father, please help me better know and live your will. I want to be your vessel of ministry, healing, blessing, and hope to those around me at work and play. Please use me to your glory today, and always. In Jesus' name I pray. Amen.